Why does God choose to save some people but not others? The Bible reveals that mankind is responsible for their sins and gives them the freewill to choose what to do, but a hyper-Calvinism would say that God elects some to destruction, but doesn’t that strip humans of their freewill? No, because they are still freely choosing to reject Jesus Christ, even though it is God Himself Who draws men and women and children to Himself (John 6:44). How those both work together, I cannot explain. That’s okay. I don’t have to know how to fly a 747 to ride on one (thankfully). I just know it flies. How all of the mechanical and natural forces work together to make something so enormous that’s able to fly, I don’t have a clue. I simply accept that it does. Why God saves some and why He doesn’t is found in Scripture, but I must tell you, when I look in the mirror, I don’t find it there. I see nothing in myself that is worth saving. I wouldn’t have chosen me to be saved. Either way, I am responsible for either believing in Christ and having eternal life (John 3:16) or for rejecting Christ and having the wrath of God abiding on me (John 3:36b). I am free to choose and I am responsible for my choices, but why aren’t more of my family, friends, and co-workers being chosen? Before we existed, before time was, and before anything was created, God had an election, but only God could vote, I mean, we couldn’t have voted then because we didn’t exist. God had a vote before we were around and it was a landslide. It was God one, everyone else, zero! Polls closed! We read about God’s election even in the Old Testament when He calls Abram (later Abraham), “Go from your country and your kindred and your father’s house to the land that I will show you. And I will make of you a great nation, and I will bless you and make your name great, so that you will be a blessing” (Gen 12:1-2). God didn’t hesitate and think, “What about what I want? Why can’t I choose to have You be my God?” All we’re told is Abraham “believed the LORD, and he counted it to him as righteousness” (Gen 15:6), however Abraham would have never believed on the Lord and had his belief accounted as righteousness unless God had first called him (Gen 12:1-2). The Apostle Paul, in writing about Jacob and Esau, wrote, even “though they were not yet born and had done nothing either good or bad—in order that God’s purpose of election might continue, not because of works but because of him who calls— she was told, “The older will serve the younger.” As it is written, “Jacob I loved, but Esau I hated” (Rom 9:11-13). This is why Paul could write that God “chose us in him before the foundation of the world, that we should be holy and blameless before him. In love he predestined us for adoption to himself as sons through Jesus Christ, according to the purpose of his will” (Eph 1:4-5). Why did He choose us? Was it because we were special or good? No, none of us qualify for that (Rom 3:10-12, 3:23). It was, as Ephesians 1:4 says it was “in love.” And that’s in His love, not ours. God loved the unlovable. 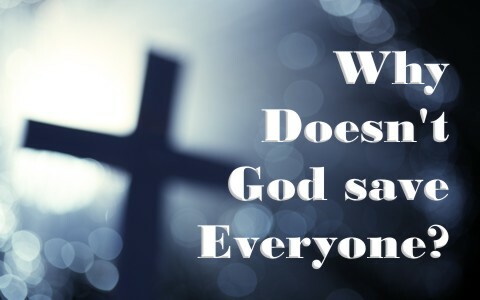 The question I hear a lot is, “Why doesn’t God save everyone?” or “Why isn’t everyone saved?” to which I would answer, “It’s not so much, why doesn’t God save everyone, but rather, why does God save anyone! We all deserve hell. None of us deserve God’s grace or to receive His mercy. Not one of us is righteous and there never has been one that was. Christ alone was sinless in His humanity, but for everyone else, it’s impossible. Someone who thinks they’re sinless is only gathering a collection of unconfessed sins, because we all sin (Rom 3:23; 1st John 1:8, 10) but we should confess (1st John 1:9). We all miss the mark. One man once told me that it bothered him that I prayed in church for God to forgive us sinners because He didn’t think he was one. I said, that’s sad my friend because Christ came to die for sinners, of which I am one of. Why doesn’t God save more than He does? For one thing, how do we know who really is and isn’t saved? Jesus said that there will be weeds in the wheat and they will both grow together, so only God alone knows for certain (1st Sam 16:7). We can observe what kind of fruit they bear, but some people grow at a much slower rate than others. What might appear to be weeds might be wheat that’s not quite come to seed yet. Every one of us are like plants in nature; we all grow at different rates, but at least we’re growing (hopefully), however anything that isn’t growing, is dying. Just ask any gardener. I have rather grown tired of hearing that God will save everyone and that in the end, everyone will go to heaven, because that’s clearly wrong. The Bible teaches that “many are called, but few are chosen” (Matt 22:14), and “the gate is narrow and the way is hard that leads to life, and those who find it are few” (Matt 7:14), so I’m not sure where they get the idea that everyone will be saved. If everyone will eventually be saved, then why did Jesus have to come and die in the first place? Do Universalists really think everyone will believe in God? Can they really expect everyone, even today, will come to believe in God by their own volition? No, some hate God so much that it would be against their will to believe in God and obey Him, and God will not interfere with a person’s freewill decision to reject Christ. Universalism is a lie from the Devil because it strips God of glory that salvation is from Christ alone (Acts 4:12), and the suffering of Christ at the Passion (Matt 27:11-50). Read more in this related article: Does God Predestine Some People to Hell? Previous post: How Do Christians View Stem Cell Research? Next post: Do You Know Your Role in the Kingdom of God?